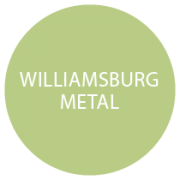 Create an experience guests will remember with the Williamsburg Metalworks collection. These custom designed seafood stands and eye-catching trays capture the essential combination of form and function. Made in the USA of highly durable, heavy gauge stainless steel, this collection of accessories bring your presentation to new heights with options for table service, room service, and hotel amenities. Explore more from the makers of Williamsburg Metalworks, RCP Design.